Excellent band. Not so excellent record. This debut album is littered with potential and the sensation that the band behind it didn't do a bad job, they could just could have done a better one. That said, the T. Bone Burnett produced Road Movies is still mostly filled with some good songs and a few pretty good ones. The album starts off with the jaunty, identifiable "Holiday from Myself" and keeps up the poppy pace with songs like the sympathetic "I Know Without Asking" ("'Cos if you need a pick-up, you can smash my old guitar") and a nice rendition of Ryan Adams' excellent "Choked Up." Slower, but still just as hummable, is the standout title track, an autobiographical tune about the band's decision to risk it all and move to the Golden State. The song is also a great addition to the canon of lusting for the West Coast songs, if only for its how-can-you-be-anywhere-else refrain of "all the roads at home are too small." The tracks also display the band's gift for some exquisite lyrics such as "She reminded me of how I got lost in the details/Of how I pay the rent, Chasing my own tail/The hours that I spent, On the dull and the dutiful/And the day to day demands" from "Lost in the Details." Or heartfelt lines like "It's so convenient to forget/All the times when you'd hardly kiss me" and "I was kind/I was good to be with" in the touching "Retrospect," a rumination on realizing you were too good for your ex. However, Road Movies suffers from two problems. 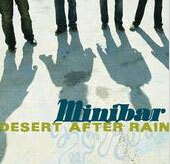 Primarily, as a British band with a soft spot for California rock, Minibar's sound ends up as an interesting combination of both influences that often just doesn't quite work perfectly. They instead end up in some uncomfortable realm between Travis (or maybe a mellow Oasis) and the Counting Crows that isn't always okay. Minibar may want to take note of artists like former touring mate Pete Yorn who more skillfully blend American and British influences. It's hard to see where the problem lies. The band has the harmonies, they have the hooks, and singer Simon Petty has a comfortable voice that ably conveys Minibar's message. But when the album slows down a bit in the last third, the strain nevertheless starts to show and Road Movies lags. Secondly, the album seems to lack the raw energy and passion that make their live performances so exciting. Live, Minibar infuses the chorus of a song like "Six Foot" ("'Cos I'm six foot tall on a good day/I'm eight miles high when I try/I can hold my own with the next man/I just need someone to tell me how tall I am") with convincing emotion of the ups and downs of life, but on the record, the song is less. Still good, but no longer great. The tragedy of Road Movies is that it's an inadequate ambassador of the band's raucous, frenetically honest stage shows. Not many people are going to simply show up to a Minibar concert on faith. So until they release an album that captures the attitude and quality the group is capable of, many more people will miss out on a worthwhile emerging band.